As Formula DRIFT returned to Los Angeles for the season finale, drivers, teams, fans and the series organizers were delighted to be back at Irwindale Speedway – the House of Drift. With only the Auto Cup decided at the previous round when Toyota amassed enough points to claim the title, there’s was everything to play. By Saturday evening we would all know the names of the 2018 Formula DRIFT Black Magic Pro Champion as well as the 2018 Formula DRIFT Link ECU Pro 2 Champion, Rookie of the Year and the Tire Cup winner. Essa would soon be eclipsed by Ryan Tuerck (USA) in the Ryan Tuerck Racing / Gumout / Black Magic / Nexen Tire Toyota 86 who scored 96 points with what appeared to be a perfect run. At least, that’s what everybody thought until Piotr Wiecek (Poland) in the second Worthouse / Falken Tire Nissan Silvia S15 put in a text book run and scored 98 points. With the tension escalating, Aasbo pulled up to the start line. He had a clean run but didn’t attack the course with the same vigor. He was awarded 94 points and would soon regret his conservative approach when Deane put up another 98-point run to drop the Norwegian to fourth. The top 15 drivers would all score 90 points or above as the 2018 championship continued to be one of the closest ever. Essa improved his score to 95, matched by Chris Forsberg (USA) in the NOS Energy Drink Nissan 370Z on Nexen Tires. Aasbo also improved to 96 points but 2011 FD ChampionDaijiro Yoshihara (Japan) in the Turn 14 Distribution / Falken Tire Subaru BRZ put in a phenomenal drive to score 97 points. It put Dai in third position behind Wiecek, who would concede to Deane after the Irishman set the stadium ablaze with an almost perfect 99-point score on the final run of the day. And with that he put the series organizers on notice to start engraving his name on the championship trophy. The 2009, 2014 and 2016 FD Champion, Chris Forsberg (USA) in the NOS Energy Drink Nissan 370Z on Nexen Tires, would also experience technical difficulty. Engine problems had prompted the team to drill out the nitrous nozzles, injecting a greater but unknown quantity of nitrous oxide into his engine. He would publicly admit his mission to retain the original “Z” engine was over and he’d investigate a new powerplant for 2019. In the meantime, he pushed the car hard on the first run against Matt Coffman (USA) in the Coffman Racing / Thunderbolt Racing Fuel / Achilles Radial Nissan 240SX S13. The lack of power presented itself in the transitions and Forsberg took a Technical Timeout before the second run, in which he’d spin at the final clipping point to give Coffman the win. Michael Essa set a blistering pace on his first run against fellow BMW driver Faruk Kugay (USA) in the Wreckless Racing E92 BMW. Kugay struggled to get close to Essa on the first run so left the start line on the second run with extra gusto. Unfortunately, he hit the wall at the top of the first banking, causing Essa to lift and follow Kugay into the wall, hitting the front corner and then the rear. Even with Essa on a flatbed, he was given the win because Kugay was adjudged to have created an “unchaseable lead.” In other words, his collision meant his run was incomplete and Essa’s reaction after the fact was inconsequential. However, it remained to be seen whether Essa’s BMW could be fixed in time for the Sweet 16 runoffs. Deane had been on fire in qualifying and expectations were high for him to win his Sweet 16 round and subsequently the title by beating Forrest Wang (USA) in the Vapetasia / Achilles Radial / NRG Innovations Nissan S15. However, Wang was reading from a different script. Both drivers were on maximum attack, with Wang getting great proximity to the champion-elect on the first run. On the second run, Deane struggled to initiate his drift into the first banking and lost ground to Wang. A collective gasp could be heard over the screaming engines below as the unthinkable unfolded. This was exemplified by the Sweet 16 matchup between third-placed Wiecek in Deane’s Worthouse sister car. Wiecek was coming off a win at the previous round in Texas and faced Aurimas “Odi” Bakchis (Lithuania) in the Falken Tires / Maxxoil / Drifz Wheels Nissan S14. He had qualified 15th but wasn’t about to be intimidated. Instead, he pushed Wiecek hard, with both drivers contacting the walls in their effort to dominate. It seemed too close to call but the crowd was expecting Wiecek to reach the final against Aasbo. However, the judge’s decision went to Odi after they reviewed the live drone footage and found the Pole had dropped back slightly on his chase run. “This has been the most ridiculous night of my life. It was so intense,” said a stunned Deane. “I had 100 percent faith in Fredric to go all the way. I have so much respect for what he did because this track is so hard to drive without any pressure, and he almost made it. I also have so much respect for Vaughn. Following Deane’s trophy celebrations, FD Irwindale winner, Gittin Jr, addressed the crowd, “I’ve been doing this for 15 years because all the teams continue to push and make it a constant challenge. The fans are amazing and bring such great energy every time we’re on the track. I’m so grateful to all of them and the teams. I’m also extremely grateful to our team because there’s something humbling about our fall but we’ve made a lot of changes and continued to fight. Fredric Aasbo looked back at a whirlwind season: “It’s been an incredible night. We’ve fought really hard all year. I’ve been through the entire spectrum in Formula DRIFT from being a nobody to a rookie, a contender, champion and now a veteran of the sports. As the dust settled on the evening’s intense competition, we caught up with Formula DRIFT president, Jim Liaw to get his final thoughts for the season. “Tonight was bananas. You just couldn’t write this degree of drama and excitement into an event. 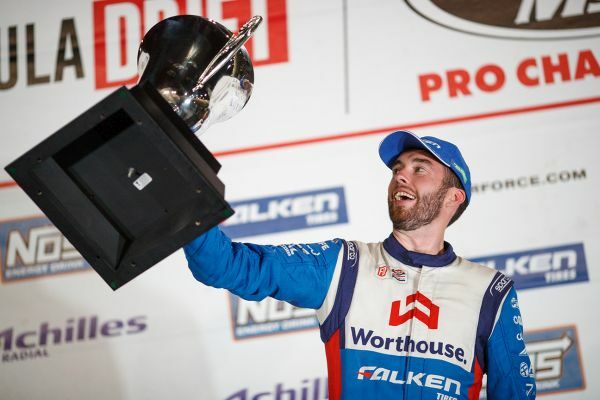 With Hughes out, Travis Reeder was the 2018 Formula DRIFT Link ECU Pro 2 Champion and it was a question of where would everybody else finish the year. Top qualifier Garrett Denton faced Trenton Beechum (USA) in his Roush Performance / Nexen Tire Ford Mustang in the Top 16. Making a single mistake on his second run, Denton was eliminated and Beechum progressed. In the Top 8 he would meet Troy Manners (USA) in the Neo Motorsport Nissan S14.5. Manners had beaten Ola Jaeger (Norway) in the Team Japan Auto / Nexen Tire Toyota Supra but would fall to Beechum after he failed to initiate on his second run. His opponent would be fellow Canadian Riley Sexsmith driving the NV Auto / Achilles Radial 2JZ Subaru BRZ. Sexsmith took a protracted route to the Final, first meeting Jonathan Hurst (USA) in the Dynosty Infiniti G37 in the Top 16. On their second run, Hurst experienced car problems, colliding with Sexsmith who subsequently brushed the wall but did enough to move on to the Top 8 where he met Brody Goble (Canada) in the Frankenstein Speed & Custom / Achilles Radial Nissan S14.75. On a wet track, Goble had a torrid time. His first run was ruled incomplete and spin on the second put an end to his challenge. We also spoke to the 2018 Formula DRIFT Link ECU Pro 2 Champion, Travis Reeder: “This reminded me of last year in Texas where I went into the round about 40 points ahead, got knocked out of the Top 16 and Kevin Lawrence came from behind to win the championship by two points. So, it feels good to have the cards fall in my favor this year,” Reeder said. “It’s great to win the championship but it’s a little bittersweet because my good friend Dylan Hughes could have also taken the title. He wrecked in practice so we put my car on jack stands and tore it apart to help him continue. 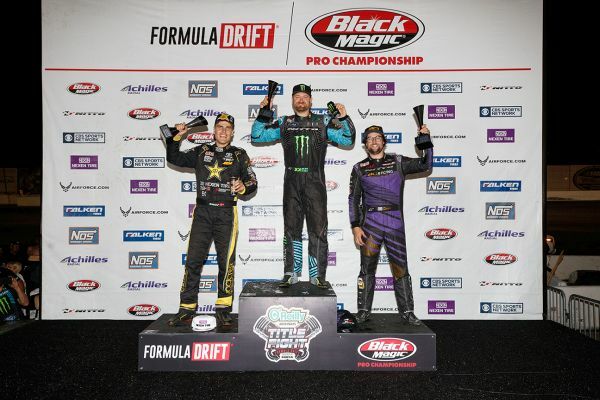 The schedule for the 2019 Formula DRIFT Black Magic Pro Championship and the Formula DRIFT Link ECU Pro 2 Championship are still being finalized.